Not a good buy. According to HP's German website, the Pavilion g7-2051sg is "simple and appealing". The desktop replacement based on AMD's Trinity platform is simple, that we can confirm. Appealing? Only to an extent. 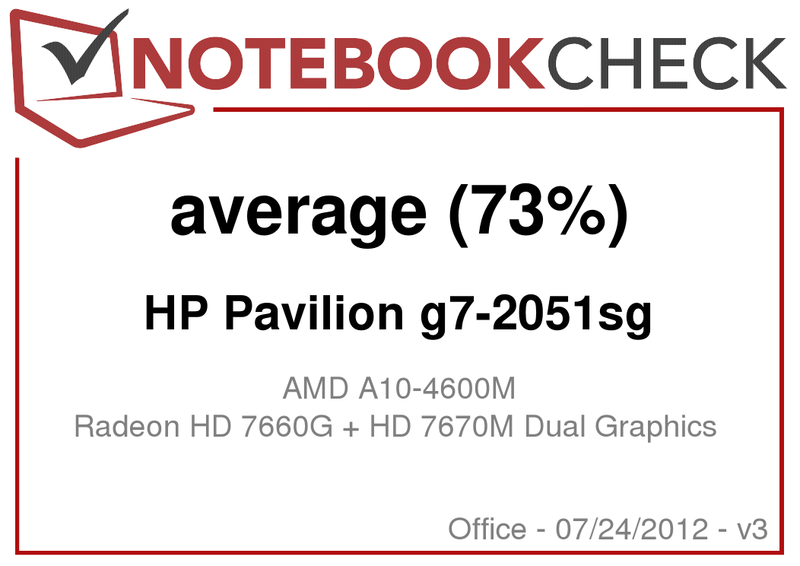 The HP Pavilion G7 looks good on paper having an A10-4600M, AMD's newest quad-core APU featuring very good integrated graphics and a decent dedicated graphics card. It comes with a 17.3 inch screen and 6 GB of working memory. All this is available for EUR 599 (~$750). Sounds really good for a desktop replacement. But the price and the feature set should raise a few flags when considering this laptop. 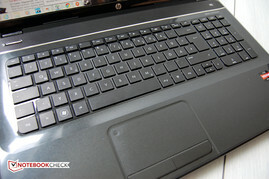 HP clearly positions its Pavilion series as consumer notebooks for "everyday computing". This especially applies to the g7-2051sg since it is evident that the 17.3 inch device is a desktop replacement laptop. It should cope with routine tasks like writing emails, Internet browsing, basic productivity as well as the odd game and movie. The basic configuration lives up to that. 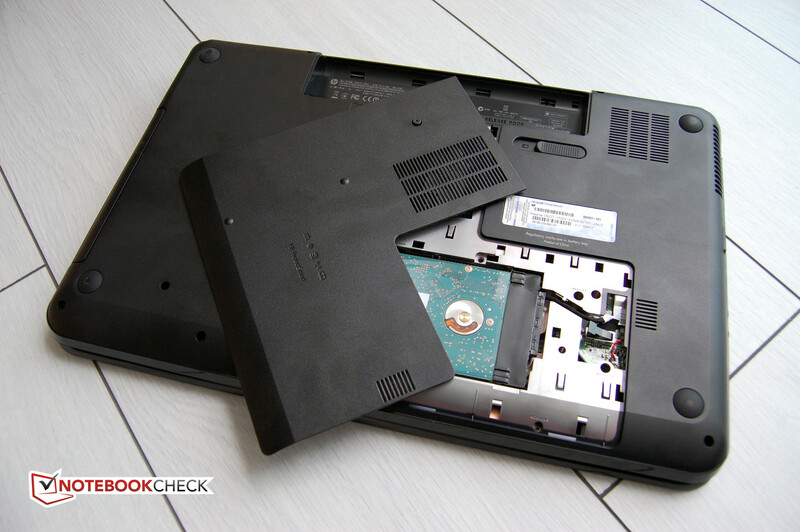 This review takes a closer look at the laptop. It is glossy. Everything on HP's Pavilion g7-2051sg is glossy. This is our first impression after unboxing the 17.3 inch notebook. HP relies on extensive use of black piano lacquer. This might look good on a piece of furniture or a polished concert piano, but on an article for everyday use, it primarily means that ugly fingerprint smudges and dust are easy to collect on the surface. The material of construction is plastic and build quality is suspect. 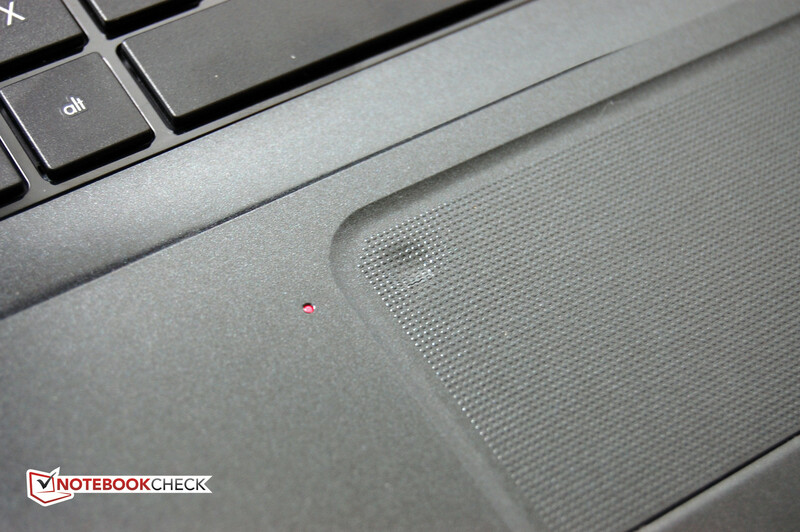 The paint finish fails to hide the average quality of the parts used in the laptop. 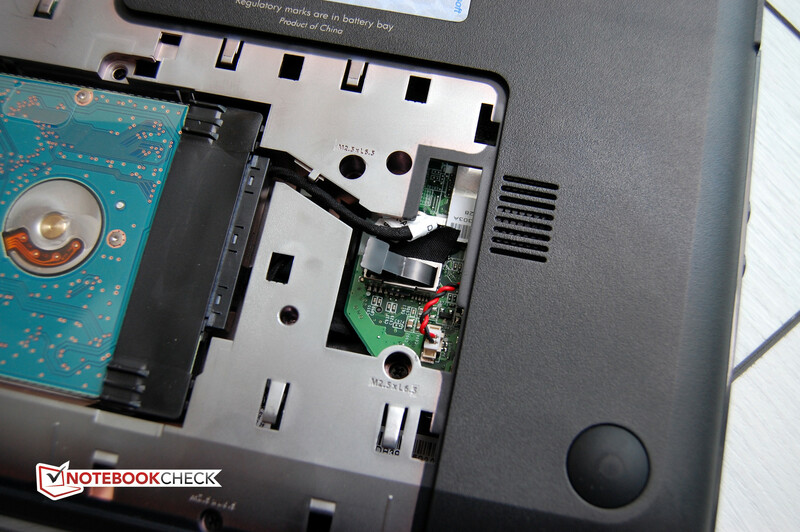 The fit and finish is plagued with irregularities which include poor assembly, bulges and indentations on the surface of the wrist area, poor battery seating and buckling of certain areas near the optical drive due to low thickness of plastics. The sharp edges around the screen add to the list of problems. The cheap looking, matte black plastic bottom harbors the maintenance cover and removable battery. Four rubberized feet ensure good stability. The display lid is kept in place by two small hinges positioned pretty far apart. They do not give reason for complaint. They however only allow a small opening angle of approximately 135 degrees. Moreover, opening the lid is not possible with one hand due to the tight hinges and lifts the entire base unit. The display lid can be twisted with little effort. Overall, the notebook has satisfactory stability. 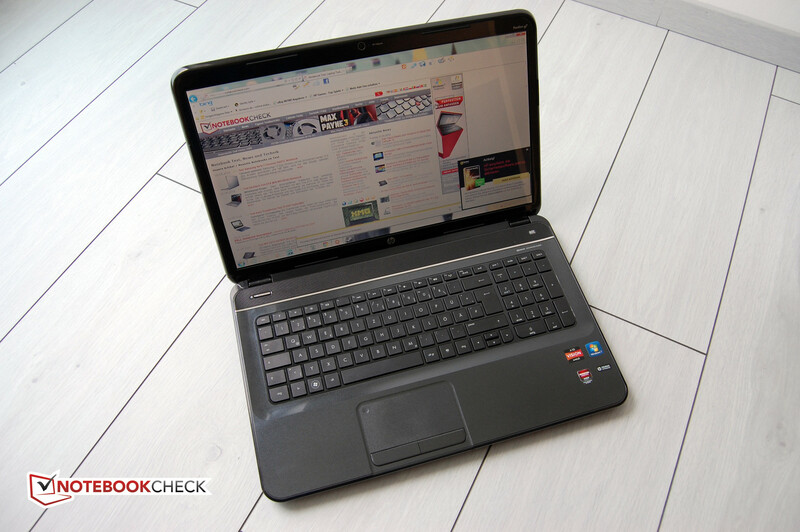 The design of HP's Pavilion g7-2051sg is of course a matter of taste, but we find it quite attractive. The rounded corners give the case a modern touch. 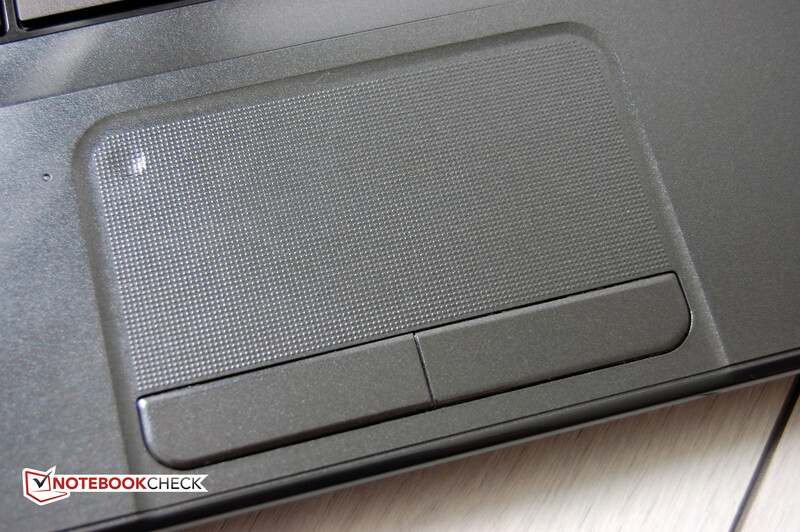 The off-center HP logo on the lid and a chrome bar above the keyboard enhance this impression. 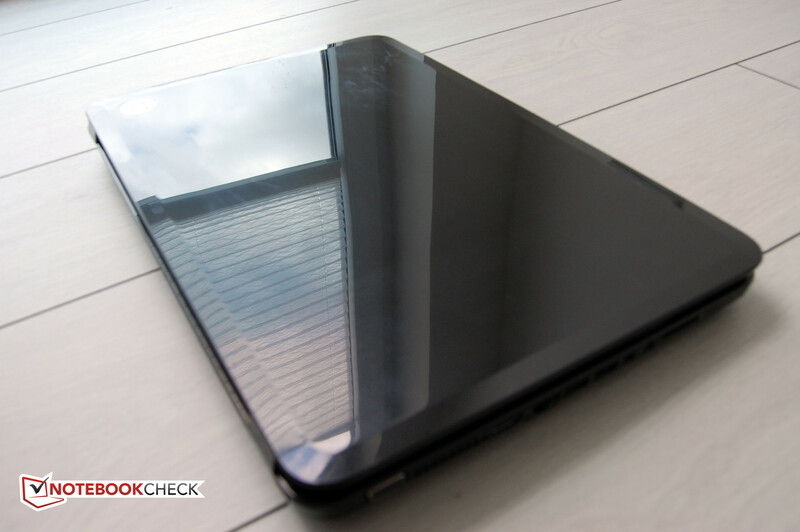 Moreover, the 17.3” laptop’s maximum thickness of 3.7cm (~1.5 in) makes it slim for this form factor. The laptop weighs less than 3kg (~6.6lb.) which makes it more portable than most DTRs. HP has done a good job equipping the G7 with the necessary ports with a decent distribution on either side of the laptop. Two of the three USB ports support the fast 3.0 standard. Unfortunately, they aren't colored, so differentiation from normal USB 2.0 ports might be difficult. The only way to discern these ports is the tiny “SS” logo available just above the port. The Pavilion g7 transmits both digital and analog video signals via HDMI and VGA connectors. 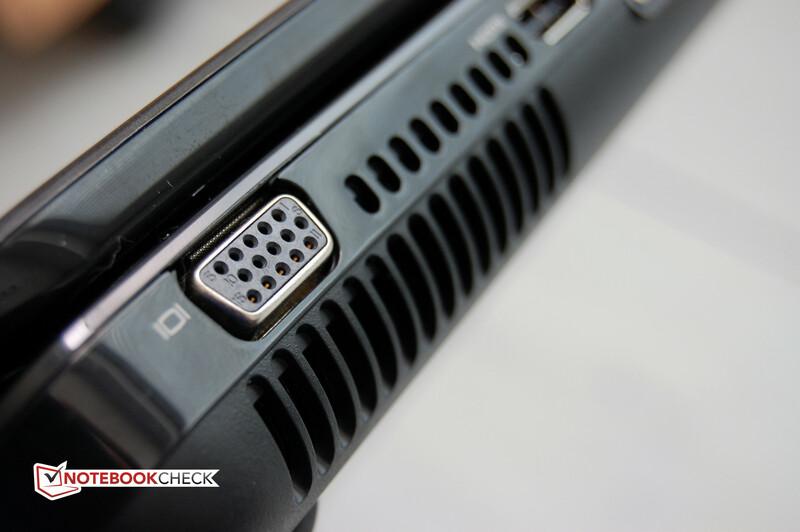 The HDMI port also transmits audio signals. A 3.5 mm headphone and microphone jack is available. We still have to mention the SD card reader that is placed agreeably near the front on the left side and the slow LAN socket at about the caps lock key's level. HP has definitely compromised on the LAN port by not providing the option of Gigabit LAN that is extremely useful when using NAS type storage devices. The manufacturer however will only have saved a few cents by omitting it. HP wasn't as penny-pinching with the wireless LAN option. The 802.11 b/g/n controller is absolutely state-of-the-art. We would appreciate it even more if it was a dual band transmitter which could make use of the less common 5 GHz range rather than the 2.4 GHz frequency. Nevertheless, the wifi module's reception is flawless. HP does not provide any other wireless communication interfaces for its Pavilion g7-2051sg. Bluetooth would have also looked good in the device intended as a desktop replacement. When the notebook and PSU were unboxed, just two paper documents were found. These are a quick start guide leaflet and a plastic bag containing an overview of HP's international service telephone numbers. That was it. A wealth of information on HP services and accessories is available on the HP website that is pretty easy to navigate for more information after the redesign. The accessories include mice and keyboards, headsets, webcams, PSUs and bags. There are no exclusive HP accessories that are really appealing. Many of the listed accessories have excellent alternatives available from other major retailers. Like many other laptop manufacturers, HP "delights" its customers with various “useful” programs. Starting with the first boot, Norton Internet Security annoys you regularly about a potential risk of your computer and prompts you to activate the 60 day trial, for a fee, of course. HP's Security Assistant and HP's Setup Manager are quite useful as they facilitate some important settings or keep the device up-to-date. CyberLink's YouCam makes using the webcam comfortable. The bottom line is that the software included is reasonable and many are full versions. 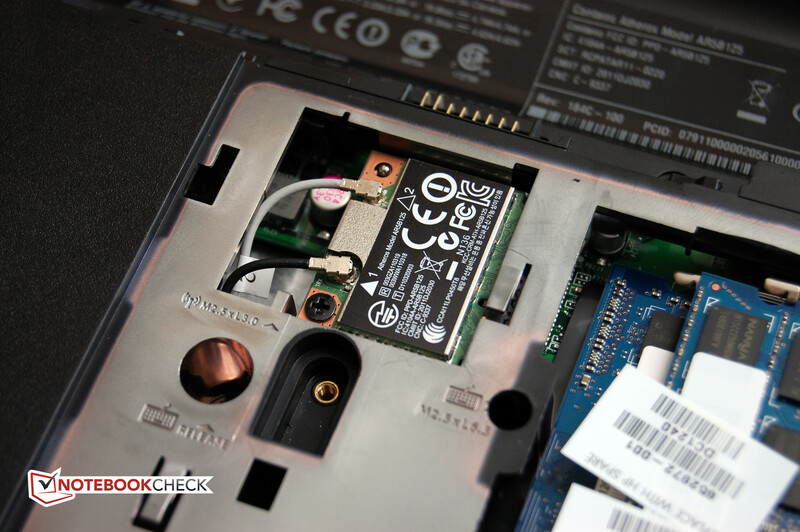 Only one screw on the bottom flap and the battery has to be removed in order to access the hard disk and memory slots. The fan can be accessed when more screws are removed. However, we refrained from this for fear of voiding our device warranty. 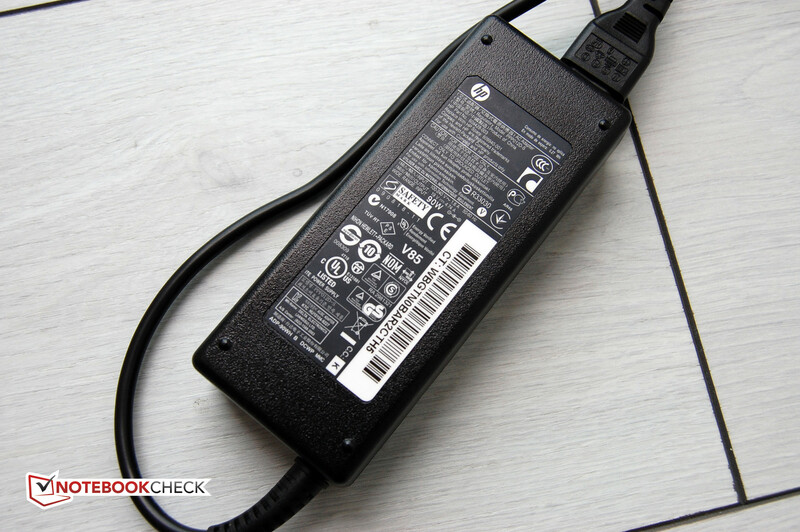 It is exemplary that HP labels every screw type with size and thread lead. That is helpful when you lose a screw or mix them up during reassembly. 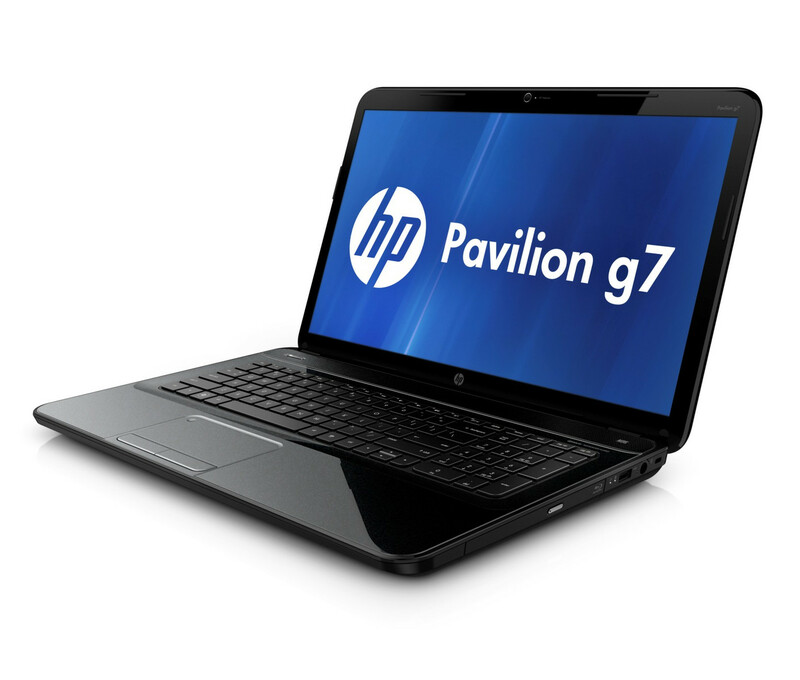 The Pavilion g7 range's manufacturer warranty is only for one year. This naturally does not have an impact on the statutory warranty of 24 months. There is a range of additional Care Pack options available for a surcharge. 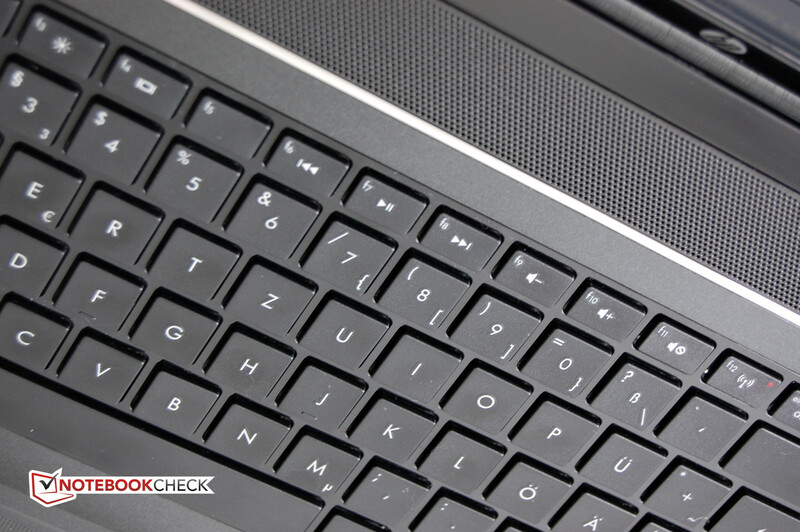 Like many notebooks, HP's Pavilion g7-2051sg features a chiclet keyboard. This keyboard model features standalone keys that look like small, beveled, rectangular blocks, very much like Chiclet chewing gum. The fact that the keys are rounded to one side looks nice and enhances the device's overall design. The unlit key's size is sufficient with an edge length of 15 millimeters and the key drop is also adequate. Chiclet-style keyboards often struggle with a spongy pressure point. This does not apply to the HP g7. By the way, the keys and the bottom flap are the only things that are not glossy. The typing experience is good. In contrast to the display lid, the keyboard area is quite rigid. The 17.3” form factor enables the manufacturer to include a number pad and four distinct arrow keys. However, the arrow keys could have been placed a bit further away from the keyboard like in conventional desktop keyboards. 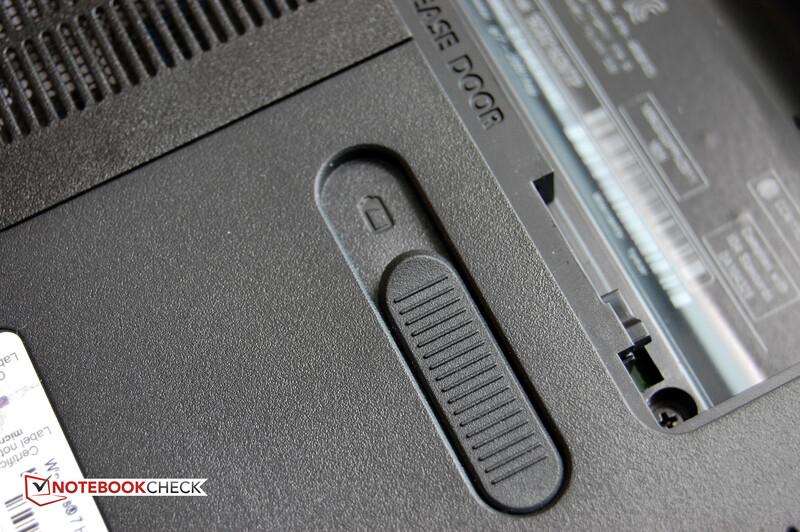 The special functions on the F1-F12 keys is a clever touch with direct access to important laptop functions. For example, they allow turning the wifi module as well as the sound on and off. The keys also indicate the status via a small diode. Two things about the touchpad stand out for us right away. Its size of 10.5cm x 5.3cm is fairly big and it has a small depression in the upper left corner. It enables and disables the touchpad. You only have to tap it twice for this. A small LED on the touchpad's left indicates deactivation. Despite the touchpad's rather rough surface, the fingers glide easily and smoothly over it. Navigation is accurate. Two-finger gestures, such as scrolling or zooming, work very well. There is not much criticism for the mouse keys, either. Except for the slightly spongy pressure point, they do their job quite well. Manufacturers keep looking for ways to cut costs and the first component that they compromise on is the screen. 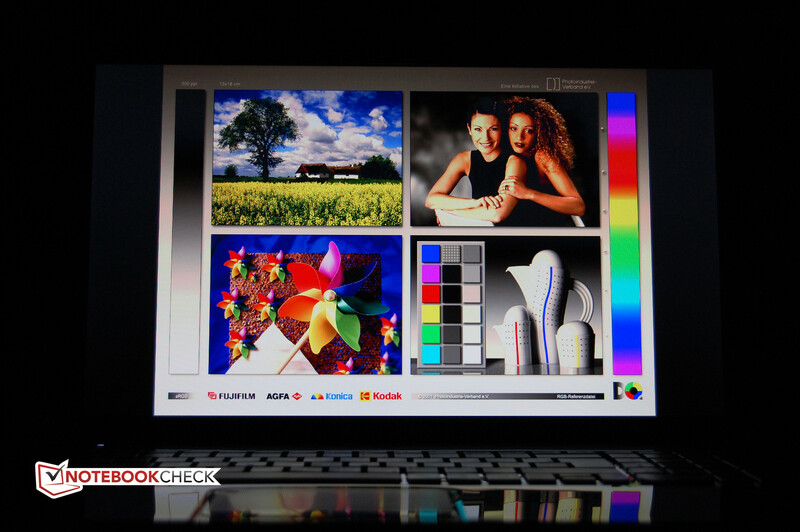 It is very rare for good quality screens to be available on budget laptops. The HP's Pavilion g7-2051sg has a 17.3” display with a resolution of 1600 x 900. Considering the price, we would not have reckoned with a Full HD screen anyway. It is a glare-type screen with LED backlight. As expected, the screen uses TN technology, likely due to the price range and is not meant as criticism. Very good TN screens do exist but are available at higher price points. 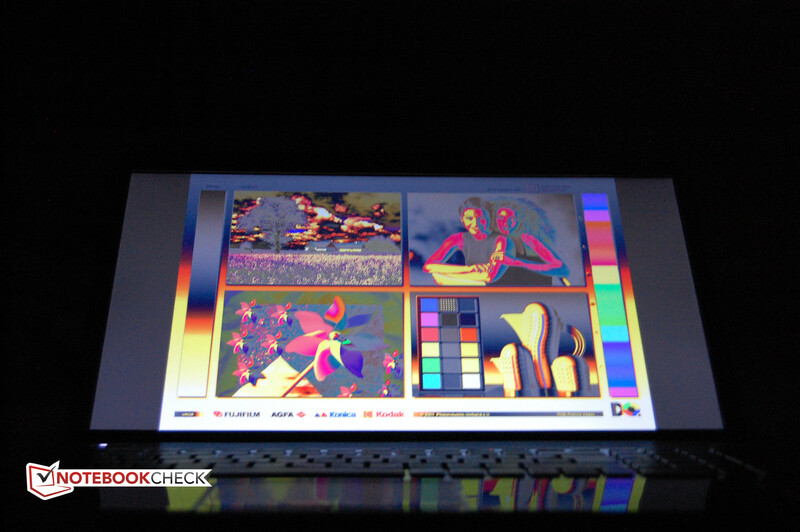 However, the installed screen exhibits weaknesses in brightness, black value and contrast in the subjective rating. There are no disturbing bright spots. The lab measurements confirm these impressions. The average brightness is only 184 cd/m2 and is sufficient for working indoors. However, the maximum brightness is too low in very bright surroundings and particularly outdoors. The substandard contrast of 169:1 due to the high black value of 1.08 cd/m2 is low. The good illumination of 93 percent cannot compensate for that. The screen's low quality is clearly noticed in practical use. Dark movie sequences look artificially brightened and colors are dull. 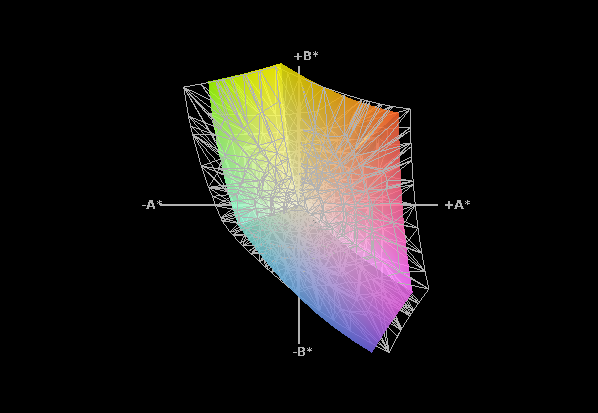 There is a relatively low deviation in the reproduction of colors. The sRGB color space is covered by 86.4 percent. 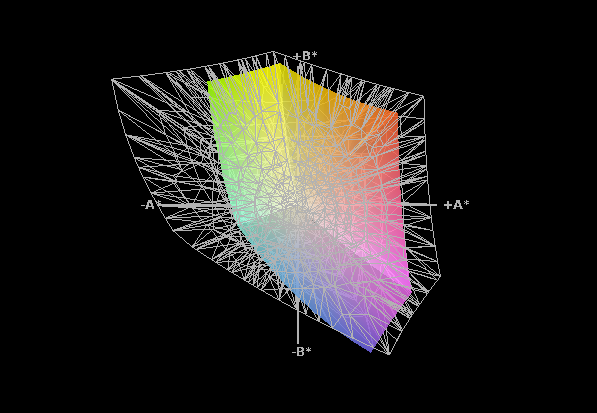 This is of course not enough for any form of professional image processing. But no one should expect that from a device in this price range. 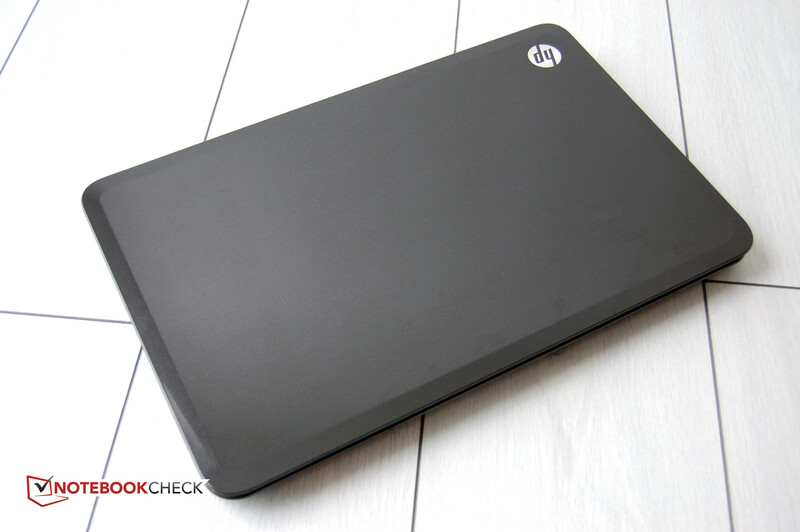 HP's Pavilion g7-2051sg would also be suitable for mobile use due to its low weight. However, this is made impossible due to the low brightness of the reflective screen. And, as mentioned in the beginning, the screen is not the only glossy thing on the g7. Annoyingly, the frame and smooth surfaces are reflective. The viewing angle stability is not one of the TN screen's strengths. It does not have many strong points anyway. While the colors stay fairly stable when looking from the sides and "only" very weak contrast images suffer, viewing from above or below is very limited. An obvious inverting and fading is noticed as soon as the screen is tilted slightly. Sharing the screen with friends to watch a movie would certainly be a disastrous experience with the Pavilion g7. 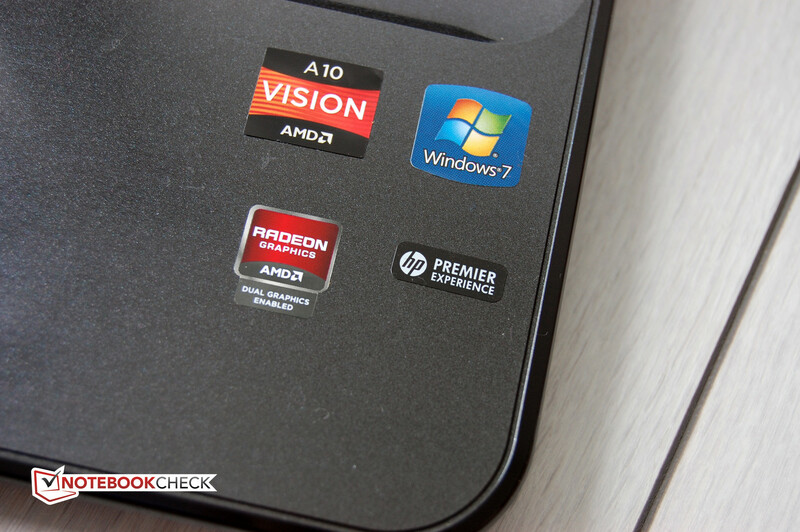 AMD's newest APU generation, called Trinity, is present inside HP's Pavilion g7-2051sg. Compared to the last generation Llano processor, the new Piledriver cores are supposed to utilize less power to provide up to 25% more CPU performance and up to 50% more iGPU performance. Our test device is equipped with the Trinity architecture's flagship, the AMD's A10-4600M. The quad core processor is manufactured using the 32nm process and comes with a base clock of 2.3 GHz which increases to a maximum of 3.2 GHz thanks to AMD's Turbo Core 3.0 technology, provided that the core temperatures do not prevent it. 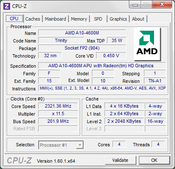 The A10-4600M's maximum TDP is 35 watts. This allows the CPU to be used in form factors as small as 14 inches. The CPU test results are not surprising. The g7 manages 8033 points in Cinebench R10's multi-CPU 64bit rendering and is on par with devices with the Intel Core i3-2310M. AMD has never been able to match Intel’s CPU performance for a very long time. But they have always had excellent integrated GPUs which are gaining relevance today due to AMD’s push for HSA and GPGPU computation support in software. 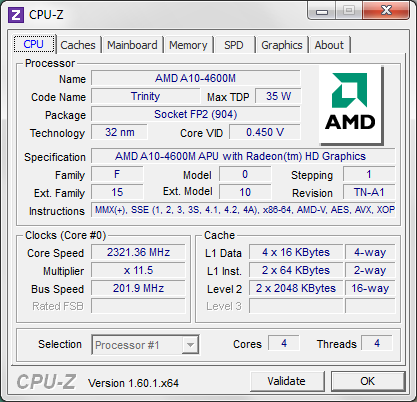 Overclocking the processor cores using AMD's Turbo Core 3.0 worked flawlessly in the test. 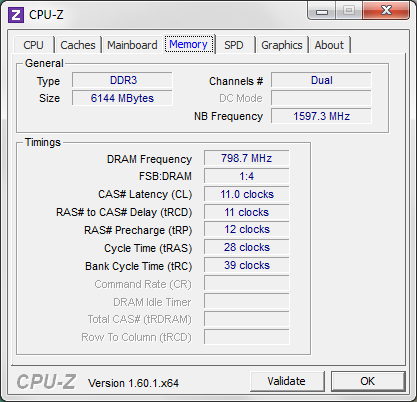 The maximum clock of 3.2 GHz is achieved in Cinebench rendering on only one CPU core. 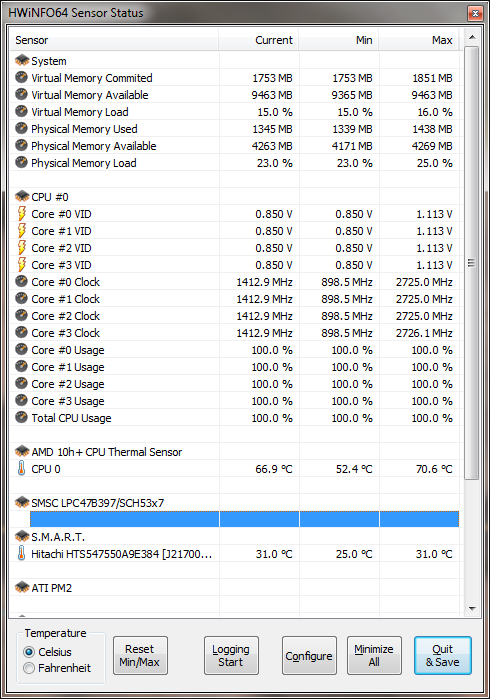 It runs at 2.7 GHz when all four cores are loaded. We use the benchmarking tools PCMark 7 and PCMark Vantage to assess the system's overall performance. 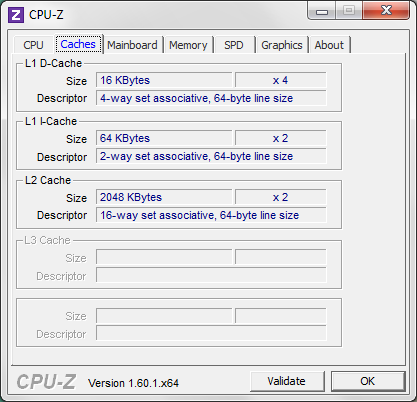 Both programs simulate a realistic notebook load by using processes like Office, video and rendering which includes all system components. Bottlenecks, such as slow hard disks, have a negative impact on the result. The PCMark test results are not exactly awe-inspiring, but are in line with HP's Pavilion g7 overall configuration. 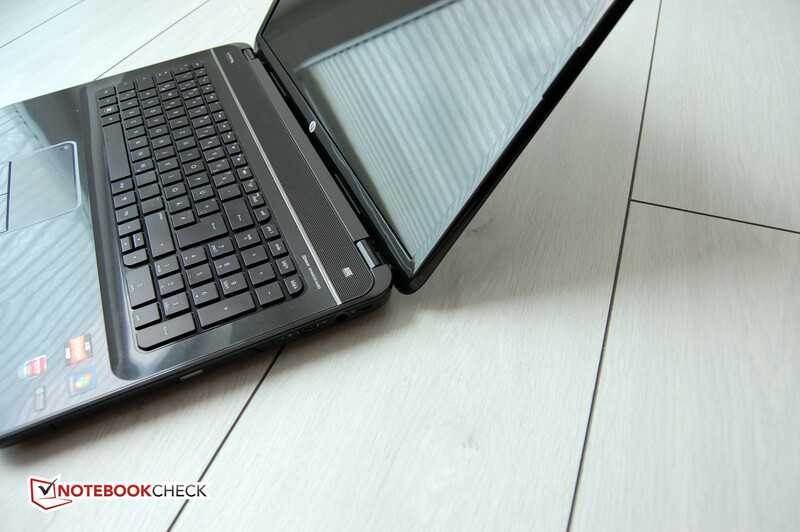 With almost 5600 points in PCMark Vantage and 1634 points in PCMark 7, the laptop’s performance is among devices such as the Acer's Aspire 5750G-2354G50Mnkk featuring Intel's Core i3 2350M or Medion's Akoya P6812 MD98760 equipped with Intel's Core i3 2330M. 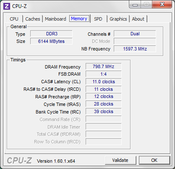 The system performance is sufficient for an affordable desktop replacement laptop. The g7 handles large normal works loads smoothly and does not appear to slow done with slightly heavier workloads. 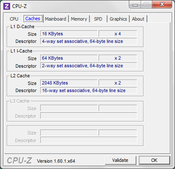 A test using DPC Latency Checker in idle mode and Internet surfing shows that the driver model is ok, and the device has no problems with real-time streaming. 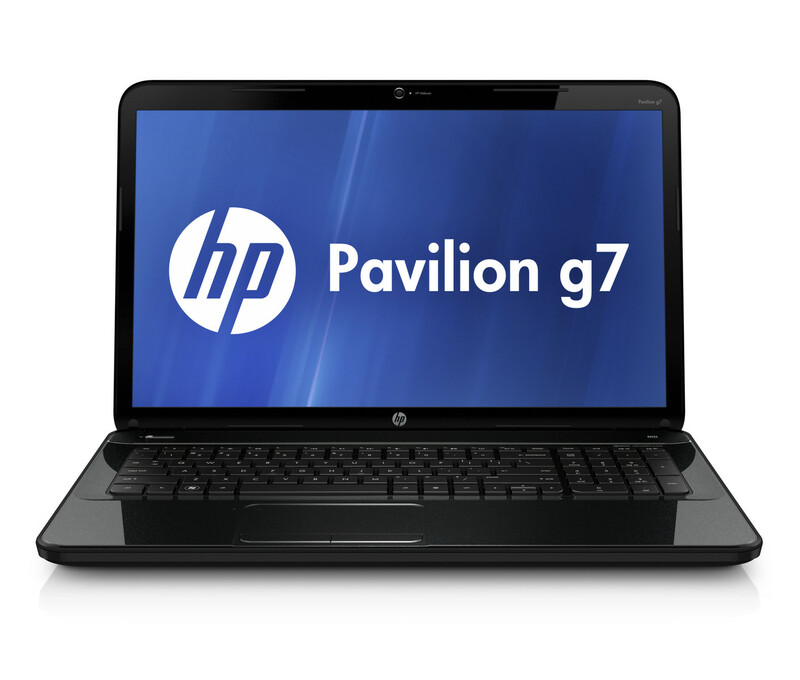 HP's Pavilion g7 only supplies standard fare in terms of mass storage. The storage devices include a SATA hard disk and an 8x DVD Super-Multi drive. A Blu-Ray drive is not available, and also not needed due to the HD+ resolution. Hitatchi's Travelstar 5K750 is a 5400 rpm drive and has a capacity of 500 GB. This model is not a fast performer. 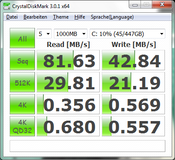 A mechanical HDD doesn’t really show the true performance that the hardware is capable of in certain tasks. 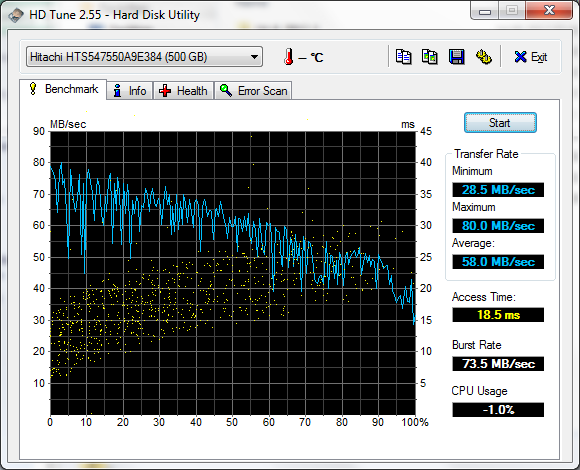 In any case, the HDD’s score in our HDD/SDD benchmark chart is much better than achieved by our Pavilion g7 model. 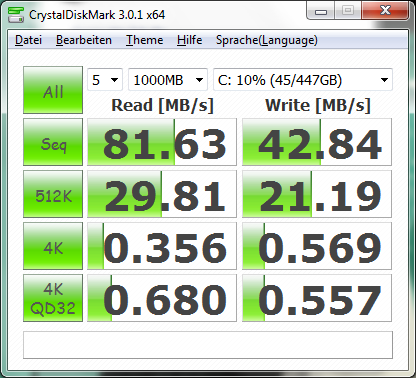 An average data transfer speed of 58 MB/s in HDTune is disappointing and the results in CrystalDiskMark do not look much better. 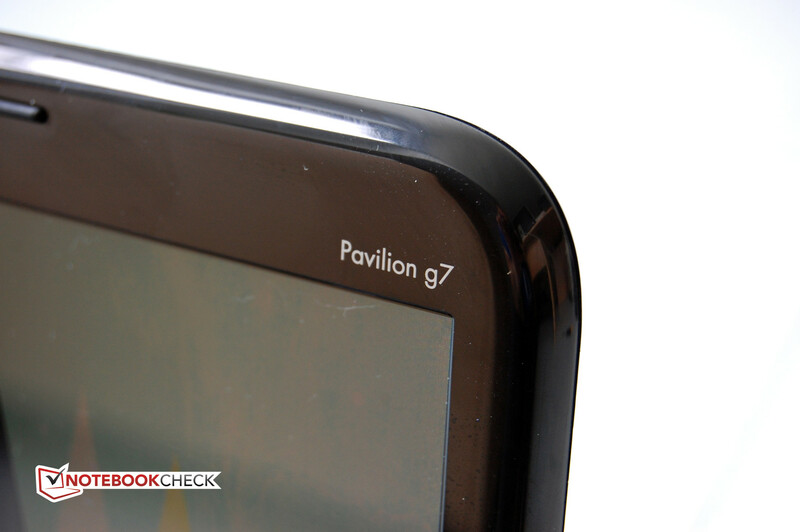 The hard disk slows down the Pavilion g7's overall performance noticeably. HP's Pavilion g7-2051sg's graphics card earns special attention. Not for the Radeon HD 7660G integrated in the Vision APU, but because HP relies on a dual-graphics solution based on AMD's hybrid crossfire technology. Besides the integrated card, AMD's Radeon HD 7670M is a DirectX 11 capable midrange GPU based on the 40nm manufacturing process. Hybrid crossfire is an interesting way to bring out more graphic performance from all the GPUs available in the system. Performance is dependent on driver and game support and isn’t as mature as we would expect. Hybrid crossfire works reasonably well with DX10 and DX 11 games because of added support. The graphics card configuration looks very appealing on paper, especially since AMD's Trinity architecture APU graphics are relatively strong on their own. The Radeon Dual-Graphics technology also demonstrated its advantages in HP's Pavilion g7 in 3DMark range's synthetic graphics benchmarks. For example, the Radeon HD 7660G and 7670M array achieved an average of about 700 points in 3DMark 06. That is almost ten percent more than what the single card could achieve. The difference is even greater in 3DMark Vantage. The dual graphics solution's lead is approximately 1200 and 2100 points in contrast to an HD 7670M and 7660G respectively. 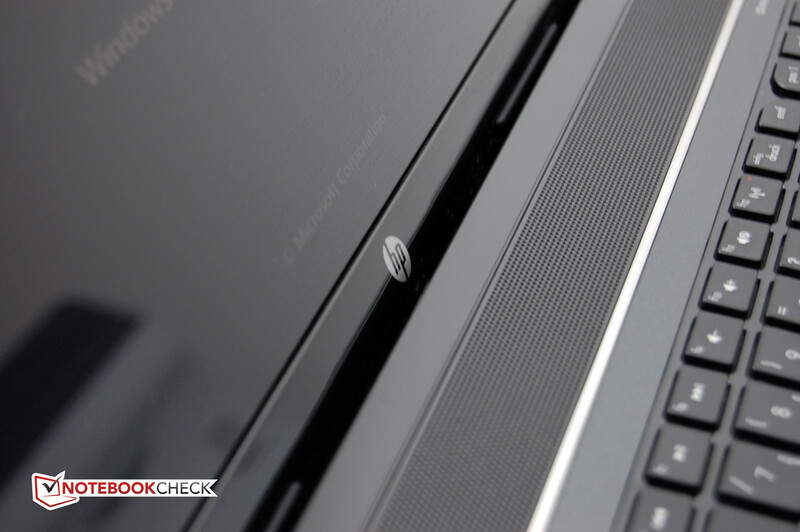 Whether HP's notebook can gain from the performance increase in up-to-date games will be examined in the next section. In any case, our previous experience with AMD's crossfire solutions is mixed. The criticism ranges from micro-stuttering to frame rates being lower than single dGPU solutions. Most of the issues related to poor hybrid crossfire performance are attributed to bad driver support from AMD. 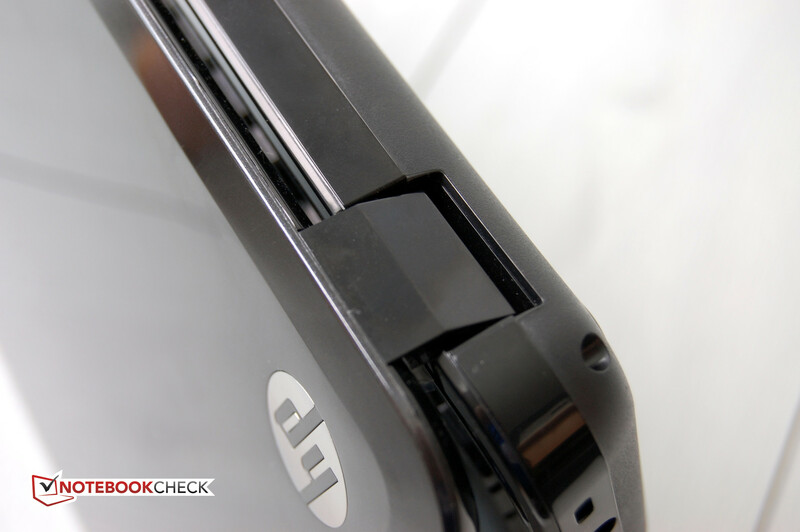 HP does not tout its Pavilion g7-2051sg as a gaming notebook. But the laptop has been able to run a few games at decent frame rates due to the dual graphics solution, which is very good for a desktop replacement in this price range. But scaling isn’t perfect. 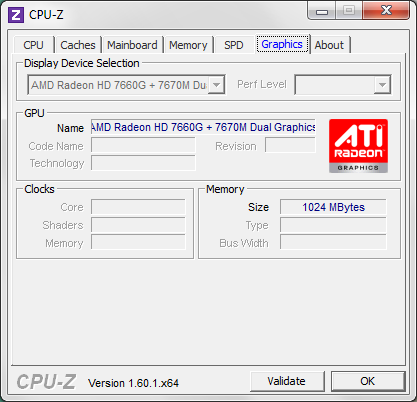 Some games just don’t support dual graphics solutions and show better frame rates with the discrete 7670M. The crossfire solution works better with modern games which have incorporated support for such setups while older games don’t support this feature. 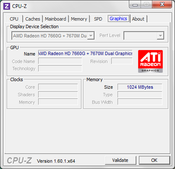 Games such as F1 2011 and Risen 2 show lower scores in hybrid crossfire mode than when running on just the integrated Radeon HD 7660G in other notebooks. We cannot test most games in medium or high details because the notebook does not support our specified resolutions. In the native resolution of 1600 x 900 we found that CoD Modern Warfare 3 and F1 2011 ran smoothly on medium details, and Risen 2 and Anno 2070 did not. Overall, we can confirm that HP's Pavilion only has moderate gaming performance. And the manufacturer only has itself to blame since it opted for AMD's dual-graphics solution. If you are looking for a quiet notebook to replace your desktop PC, you will definitely not consider the HP's Pavilion g7-2051sg. The fan is never really silent and it always spins audibly even when idling. The minimum reading of 31.6 dB was recorded which is not really disturbing in an office environment. However, the fan increases its speed considerably when just surfing or working with Office documents and generates a noise of up to 33 dB. Sensitive users will find this is a bit too loud for such a device that is perhaps occasionally used in the living room. 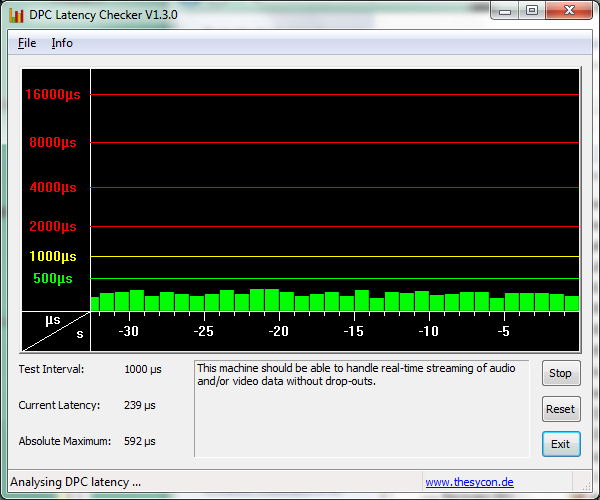 The fan turned up in volume to a slightly higher 34.6 dB when playing a DVD is the noise was produced by the DVD drive. If you can live with almost 35 dB, your ears are bound to feel irritated by the fan under load conditions. A maximum of 46.7 dB was measured which is very much audible in an office environment and is definitely disturbing in quiet rooms. The noise goes up and down in short intervals and this makes the fan's noise seem louder than the real measurements indicate. The CPU is a dual module design with a maximum of 35W TDP that creates a lot of waste heat. Keeping this in mind, HP should have made the thermals their top priority when designing the laptop. To test the device's construction under extreme load, we performed a two hour stress test using Furmark and Prime95. The temperatures stayed within acceptable limits on the top. The wrist rest got a bit too warm on the far left, being about 37ºC. It looked very different on the bottom, particularly in the center. A hot spot of 63.6ºCis not a good omen. And in fact, all CPU cores throttled down to 900 MHz after a few minutes of stress testing. This is most certainly due to poor thermal design. It is good to know that this situation will not have a negative impact in practical use. A 3DMark test executed immediately after the multi-hour stress test gave the same results as in a cold state. The device did not get unduly hot in routine use. The Pavilion can even be used on the lap for a longer period without getting unpleasantly warm. However, it is no fun during load. The power supply heats up to 51.3ºC, which is also too hot in our opinion. 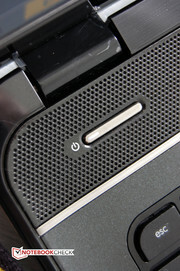 The speaker placed across the front of the keyboard is a very nice surprise in an otherwise average laptop. It takes up the case's entire width. 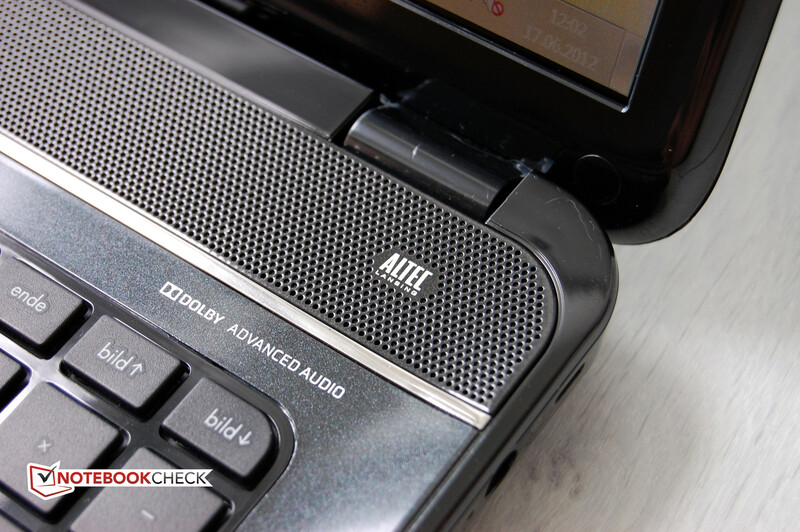 According to the spec sheet, it is an Altec Lansing speaker featuring Dolby Advanced Audio. The speaker did a good job in the test. It is more than sufficient for movies, both in terms of volume as well as sound quality. Music is a bigger challenge. However, there is not much reason for complaint as long as you do not focus on bass-heavy tracks. The sound is clear and free of any distortions. The trebles are perhaps a bit over-emphasized, but this is a typical problem with small speakers. If we are nit-picking, then we would like to see higher volume output from the speaker and better support for bass. 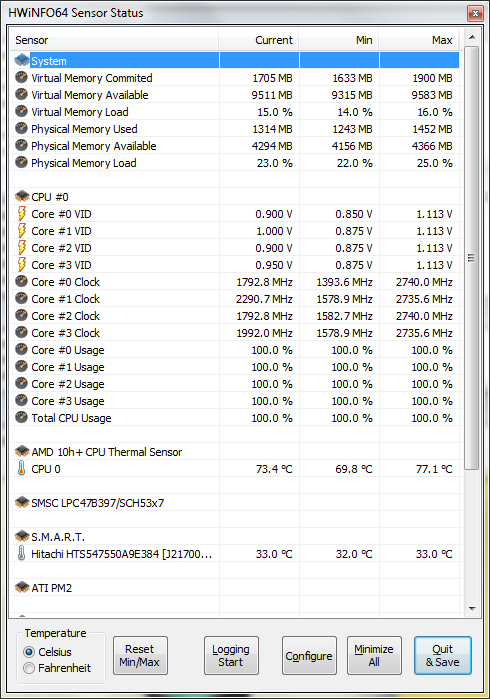 Although HP's Pavilion g7-2051sg gets very hot in some areas, the power consumption is at least decent. The 17.3 incher never consumes more than 12.9W when idling and this is when having the screen at full brightness. The device benefits from lowering the brightness. 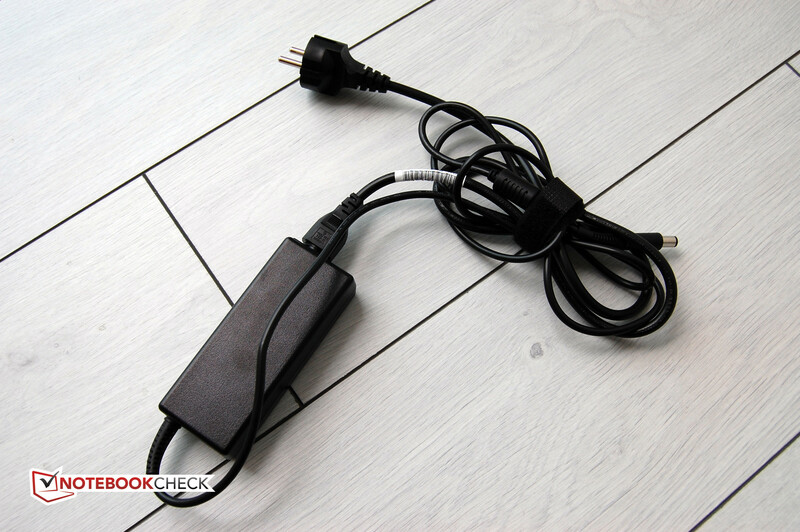 The power consumption is 0.1 watts in a deactivated state and a maximum of 0.4W in standby mode are also absolutely acceptable. The power consumption increases to 50W during medium load, which is still acceptable considering the big screen, the quite powerful APU and dual-graphics solution. The maximum power consumption settles to 57W when the device at full load when we run Furmark and Prime tools simultaneously. Some gaming notebooks easily consume twice as much here. Thus, the preconditions for long battery life are present but the battery being only of a moderate capacity of 47 Wh does not help with providing long runtimes. In fact, the battery life tests show that HP's Pavilion g7-2051sg is not really good at endurance. The maximum battery life of eight hours is still acceptable in Reader's test, using minimum brightness. However, this isn’t significant as it is not characteristic of normal usage patterns. This is also true for the minimum possible battery runtime that we measured using the BatteryEater Pro's Classic test. Here, all communication modules are enabled and the screen's brightness is set to maximum. The Pavilion drained out after 1:19 hours. The runtime when surfing with wifi or playing a DVD is more realistic. The brightness is set to 150 cd/m2 for surfing and DVDs are rendered at maximum brightness. The laptop lasts for almost three and a half hours in both cases. That is absolutely sufficient for a movie. However, the battery runtime is not going to be enough for routine use (e.g. Internet surfing) and office tasks if you need to stay away from the main for a long period of time. With its Pavilion g7-2051sg, HP addresses price-conscious consumers looking for a notebook to replace their desktop. The device's price of EUR 599 (~$750) is reasonable considering the 17.3 inch screen, the quite potent CPU and GPU platform and decent hardware. Nevertheless, we cannot give this device a purchase recommendation. There are simply too many points of criticism. We will however start with the positive aspects. The 17.3 incher's design appeals to us. The weight of less than 3kg (~6.6lb.) and acceptable thickness enables the device to be used as both a desktop replacement as well as for short, mobile outings. The keyboard and touchpad are well-designed and allow for a comfortable typing experience. The connectivity options are acceptable and sufficient for all application fields. The choice of CPU and GPU has been made in consideration of the target group. The speakers deserve a special mention. But now to the things we did not like as much. The criticism starts with the manufacturing quality. The display lid can be twisted very easily and it is also surrounded by sharp edges. The choice of materials can be explained away due to the the low price. That likely also applies to the screen. 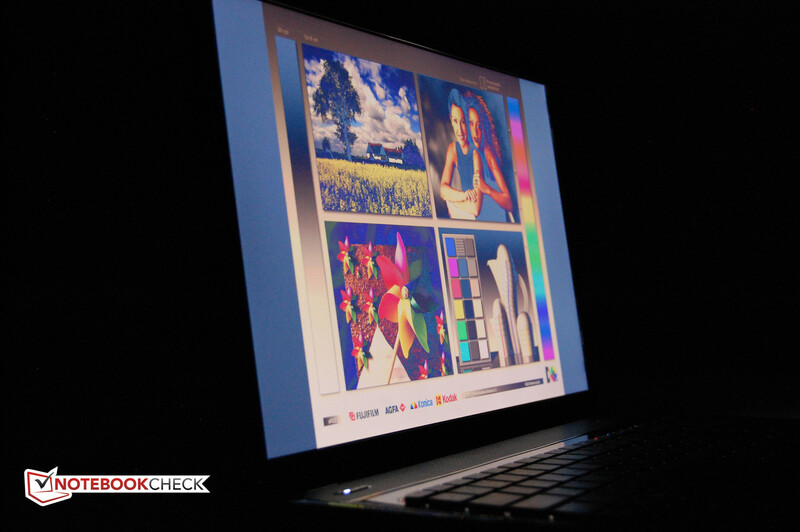 Nevertheless, buyers looking for an affordable notebook expect a certain quality. HP's Pavilion g7 cannot meet this expectation with its weak TN screen. If moderate brightness could still be accepted, the low contrast and high black value result in poor visual quality that is difficult to overlook. The loud fan operation is another bone of contention. It does not always manage to cool the device reliably either. This leads to throttling of the processor cores, but it fortunately does not have any impact in practical use. But moderate battery life does affect users when it comes to productivity away from the mains. When we add up all pros and cons, we end up a laptop that is cheap but simply does not make a good buy. The optical drive: DVD Super-Multi. A diode indicates whether the touchpad is enabled. And this is inside of me. The laptop also runs without battery. The battery is locked via a slider. The innards are only one screw away. The Pavilion g7's design is very striking. Its weight and size also fit. Bluetooth and a better screen. The installed screen points to extreme cutbacks. The graphics solution did not really manage to surprise us. We already feared that AMD's dual-graphics performs a lot worse than its printed specs would let us expect. We would prefer a solution like Intel's Optimus here in any case. The competition is high among budge desktop replacement notebooks and even is found in HP's rows as the Pavilion dv7-6101eg, among others. 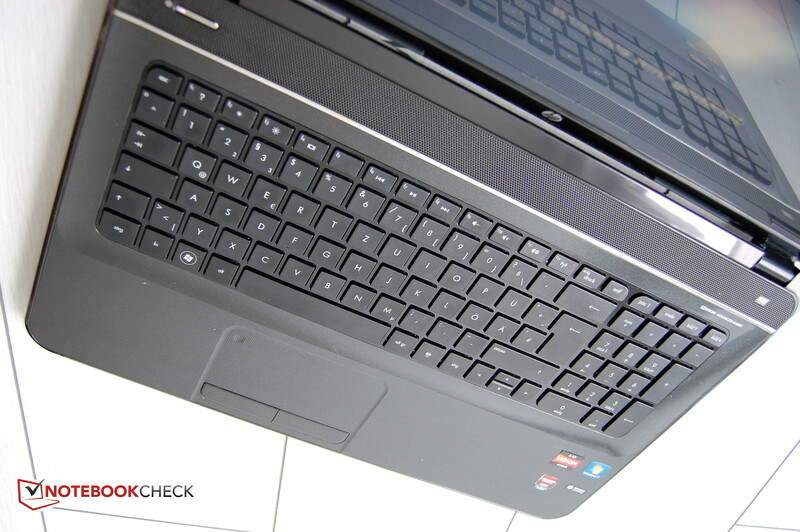 Other contenders are for example Lenovo's G770 M533AGE and Toshiba's Satellite L775-125.